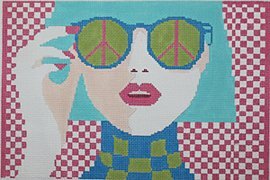 Sunglasses girl by Voila is a contemporary image of a girl with sunglasses depicting the peace symbol. It is in bright colors of pink, green and white. The design area measures about 12.5" x 8.25". The design is handpainted onto 13 mesh mono needlepoint canvas and is perfect for beginner level stitchers. You can buy the canvas alone, or with threads. If you choose cotton we provide DMC cotton floss; for silk and wool we provide Planet Earth single ply fibers which are designed for 13 mesh canvas. If you'd like some glitter, choose Mixed threads and we'll add kreinik braid or Glisten by Rainbow Gallery, depending on the color. If you want to hold the canvas taut on stretcher bars while you stitch it then we recommend a pair of 12" and a pair of 16" bars plus some thumb tacks.